Anatoliy was a retired Post-Soviet Ukrainian who began working with MUCH at age 64. Aside from a smoking habit and failing vision, he was a very healthy man. He formerly worked in Magadan, by the east coast of Russia. God gave him a great heart for children. That is how we met. For the past 12 years he has been managing our outreach in one particular orphanage in his city of Marganets . 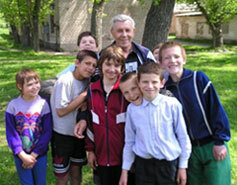 Anatoliy built a great relationship with the children of the orphanage over the years, but he didn’t record the different stories. On one of Mark’s visits, he did share a story with Mark. See how contributions to MUCH are changing the lives of the children and making an impact upon the community through his story. In December 2008, I sent him money for pleasure reading books for the children. He found a store that could order the books that the manager of the orphanage was interested in having for the children. Because of the quantity, the orphanage was given a discount. Also during this visit, new coats were bought for some of the children. It is, in fact, what you have done for them through your prayers and contributions. In May 2014, Anatoliy died after a long illness. Even while lying in bed and unable to walk, suffering unbearable pain during his illness, he gave directions for the children’s needs.